Happy Monday! I hope you all had a stupendous weekend! Apparently this little suckers are really popular these days. There are entire cookbooks dedicated to making them in every conceivable shape and flavor! I decided, I suppose due to peer pressure, I should give in a make some. For my first time, I think they turned out dang good! I have a bunch of almond flour I keep finding ways to use, and I had mass quantities of grapefruit curd, so I figured these were a good use of my ingredients. All in all, they aren’t that hard to make! It makes me nervous to work with egg whites, honestly, because there is so much potential for deflation and therefore an awful end product! Luckily, these worked out just fine! Perhaps next … a soufflé! I whipped up my egg whites, added the necessary sugar and lemon zest, then used a pastry bag to make rounds onto parchment paper. I probably should have waited slightly longer for the rounds to dry, making the nice smooth film on top, but most of them ended up being dry enough. I suppose leaning on the side of too much drying time wouldn’t be a bad thing! Tart, crisp, and sweet. 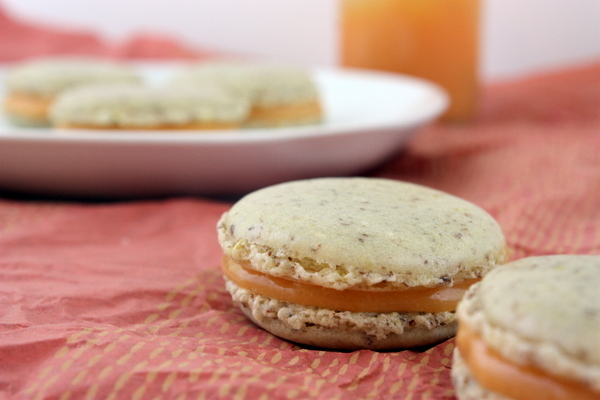 These macarons are the perfect light desert to follow any meal. Combine almond flour, powdered sugar, and lemon zest in a bowl. Set aside. Combine the granulated sugar and food coloring, and mix until the color is dispersed. Beat egg whites until foamy. Add yellow sugar gradually while continuing to beat the egg whites until shiny soft peaks form. Gently fold in the almond flour mixture with a rubber spatula, taking care to not mix too much. Pour the batter into a pastry bag and pipe small rounds onto parchment paper. Let the rounds dry for 45 minutes to develop a dry shell on top. Preheat the oven to 300 F and bake for 9-11 minutes. 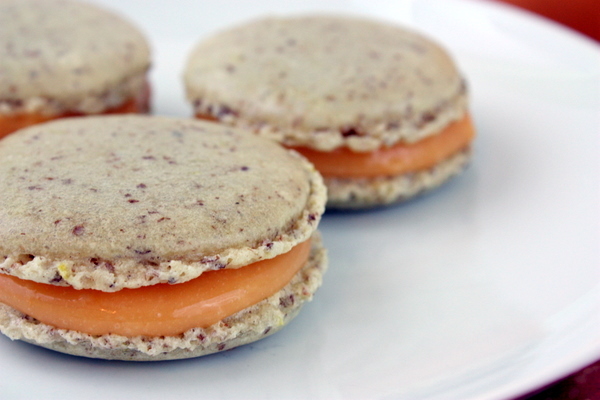 Allow the macarons to fully cool, then carefully pair them according to size. 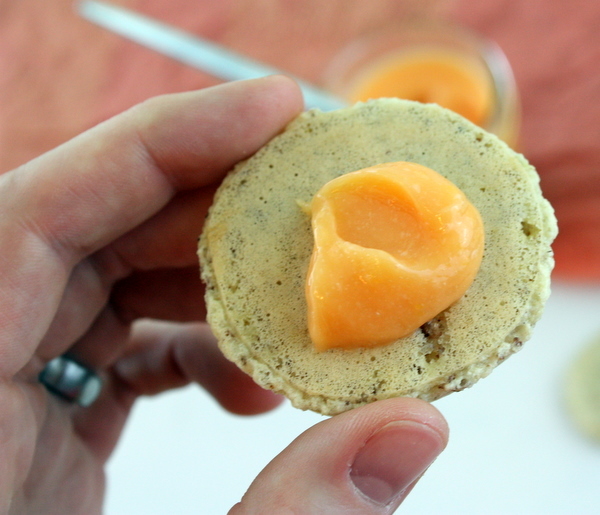 Place a small dollop of grapefruit curd on the inside of one shell, then sandwich the pair together. I used the almond meal I had on hand, which clearly was not from blanched almonds. 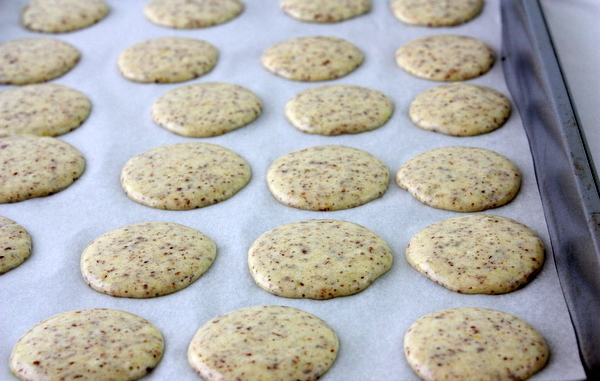 If you want a cleaner, lighter, look to your macarons, you can either get blanched almonds and grind them yourself, or buy blanched almond flour. Yummmmm! I adore grapefruit. I once made a citrus tart that was filled with grapefruit curd…swoon! Yum! I'll have to take a look at your recipe! !